I built the easy-to-interpret LRM, and the not-so-easy-to-interpret GenIQ Model for the target variable Play (yes). This creates a counterpoint where the data analyst now can choose between a good interpretable model and a potentially better unexplainable model. 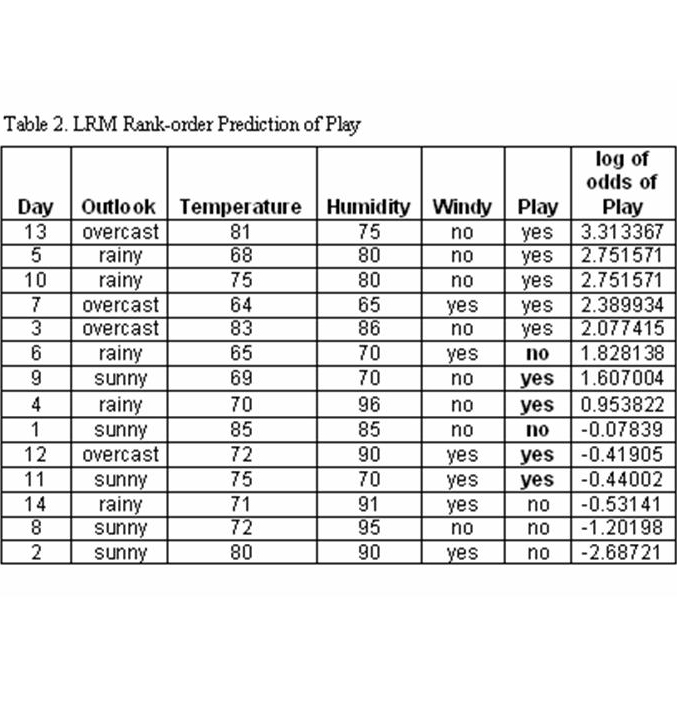 The LRM output (Analysis of Maximum Likelihood Estimates) and arguably the best Play-LRM equation are below. 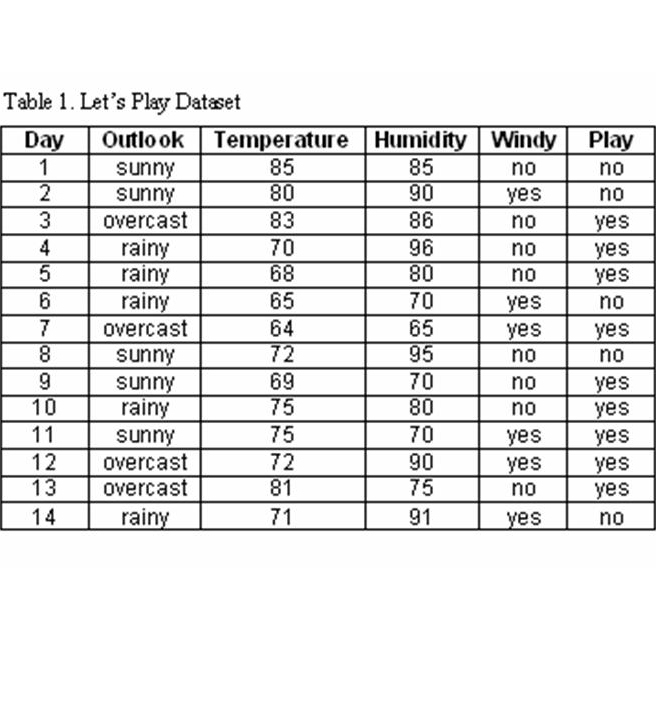 The results of the Play-LRM are in Table 2. There is not a perfect rank-order prediction of Play for days 6, 1, 12 and 11. The Play-GenIQ Model tree display, and its form (computer program) are below. GenIQ variable selection provides a rank-ordering of variable importance for a predictor variable with respect to other predictor variables considered jointly. This is in stark contrast to the well-known, always-used statistical correlation coefficient, which only provides a simple correlation between a predictor variable and the target variable - independent of the other predictor variables under consideration. GenIQ data mining is directly apparent from the GenIQ tree itself: Each branch is a newly constructed variable, which has power to increase the rank-order predictions. 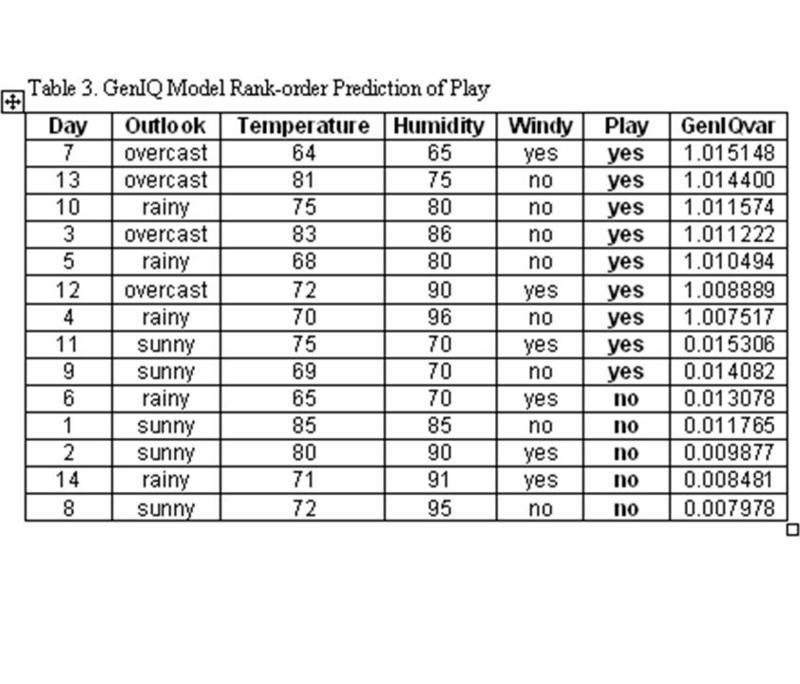 The results of the Play-GenIQ Model are in Table 3. There is a perfect rank-order prediction of Play. The machine learning paradigm (MLP) “let the data suggest the model” is a practical alternative to the statistical paradigm “fit the data to the LRM equation,” which has its roots when data were only “small.” It was – and still is – reasonable to fit small data to a rigid parametric, assumption-filled model. However, the current information (big data) in, say, cyberspace require a paradigm shift. MLP is a utile approach for database response modeling when dealing with big data, as big data can be difficult to fit in a specified model. Thus, MLP can function alongside the regnant statistical approach when the data – big or small – simply do not “fit.” As demonstrated with the “Let’s Play” data, MLP works well within small data settings.